Saudi Arabia’s Al Rajhi Bank remains the safest Islamic bank in the Gulf Cooperation Council countries (Saudi Arabia, Kuwait, Qatar, UAE, Bahrain and Oman), followed by Al Hilal Bank, based in Abu Dhabi, and Kuwait Finance House. Al Rajhi holds three A+ ratings, giving it a score of 18 points, whereas Al Hilal holds only two A+ ratings and no third rating, and so scores slightly lower at 17 points. Kuwait Finance House has two A+ ratings and an A-, giving it a total score of 16. Four banks have an A+ rating from Fitch, an A rating from Moody’s and no rating from Standard & Poor’s (S&P), giving them a total score of 15.5 points: Abu Dhabi Islamic Bank, Ahli United Bank, Qatar International Islamic Bank and Barwa Bank. 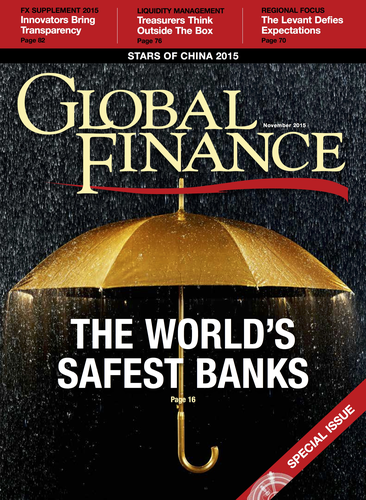 The scoring methodology used for GCC Islamic banks is the same as that followed in Global Finance’s ranking of global, emerging markets and commercial banks: If a bank holds only two ratings, then an implied score is calculated for the third by taking the average of the other two ratings and deducting one point. However, the scoring methodology for the GCC Islamic Banks ranking differs from that used elsewhere in our rankings in that there is no minimum asset size requirement. Al Hilal Bank’s asset size of $11.2 billion places it outside the biggest 500 banks in the world and so precludes its inclusion in the ranking of the Safest Emerging Markets Banks. The same applies to Ahli United Bank of Kuwait, Qatar International Islamic Bank and Barwa Bank, whose scores would have also placed them among the Safest 50 Emerging Markets Banks were it not for their asset sizes. Banks that did not make it onto this year’s list include Al Baraka Islamic Bank, based in Bahrain, which is rated BB+ from S&P, and Bahrain Islamic Bank, which is rated Ba3 by Moody’s. Most other ratings assigned to GCC Islamic banks are either A+ or A. No GCC Islamic bank holds a rating above A+. The Islamic banks identified by Global Finance are either described as Islamic banks by their regulator or define themselves as Islamic banks. Some conventional banks conduct large amounts of shariah-compliant business through Islamic ‘windows,’ which are separated from conventional banking lines but run in parallel. For example, the majority of National Commercial Bank’s operations are shariah-compliant, and since the bank is one of the largest in the GCC, it conducts more Islamic business than most wholly Islamic banks in the region. But because it is not wholly Islamic, it is not included in our rankings of the Safest GCC Islamic banks.